"This affectionate collection of material for children featured both familiar childrens' material and new songs alike." Being that The Nat King Cole Trio was a hip contemporary ensemble of jazz cats doing sophisticated jazz or ballads, they might have seemed to some to be an odd choice to make a childrens' album. But their other specialty, novelty numbers, might have given Johnny Mercer or someone at Capitol the notion to have Nat do a childrens' project. Or possibly someone perceived that Nat and the Trio had an inherent sense of whimsy and an affable gentility that would lend itself to childrens' music just perfectly. Whoever thought of it and whatever inspired it, the idea proved a brilliant move. King Cole for Kids was a sharp change of pace for Nat at this point. Rather than stick to the formula of the Trio and run off some kids songs, Nat and company took a much more novel approach including novel uses of the Trio and - gasp - even orchestra. The latter examples are among the earliest instances of Nat singing with an orchestra. In Ke-Mo-Ki-Mo (The Magic Song), Nat plays the celeste, as he had on a few Trio transcriptions. Another variant from the typical Trio formula of this time is the narrative story, The Three Trees, which includes sound effects by Pinto Colvig, most known today as the voice of Disney's great cartoon character Goofy. This affectionate collection of material for children featured both familiar childrens' material and new songs alike. It's a charming collection to be sure. 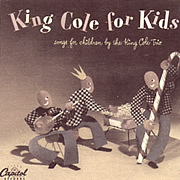 The King Cole for Kids sessions also produced other tracks of interest; principally, the mega-hit Nature Boy came from the same session. Another song with orchestra recorded at these sessions - Wiegenlied (Brahm's Lullaby) - went unissued until 1990 on the CD Cole, Kids and Christmas! Last but not least, there was an untypical Trio instrumental, Laguna Mood, which has as its title suggests, a definite mood. So it may be seen that the undertaking of this project paid dividends in many wonderful ways. As with his first album, King Cole At The Piano, this was a boxed set of 78-rpm shellac records, and soon would be an early entry on that newfangled format, the 10" vinyl LP, with the addition of two tracks not released in the 78-rpm set. Or seems as though it should have been: but don't go hunting for that slab o' vinyl just yet. The number and listing is evidently logged in catalogs and Capitol's records, but it seems no one has ever seen even one copy. It's almost certain that H-3070 was never issued (and along with it, Three Blind Mice and I Wanna Be A Friend of Yours) and therefore the only King Cole for Kids release was the original 78-rpm set, DC-89.